School Children of Primary and Junior High in Japan often struggle to find a suitable theme of their homework assignment during summer vacation. However, they need not worry anymore because the Baseball Hall of Fame in Tokyo is ready to help. 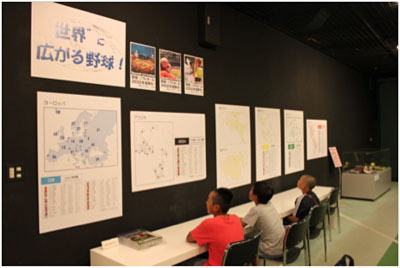 In addition to the usual displays of baseball history and equipment, the Hall hosts special exhibition entitled “Expanding World of Baseball!” from July 20 to September 1, and children can learn population, geography, economy and other information of 125 IBAF member countries/regions.